This mod adds resource hogs to the game. A resource hog is a pig-like mob that the player can use to farm resources. This mod is intended to be used by modpack authors, and allows the modpack author to define which resources can be farmed, and various properties of the resource hog mob. A resource hog is a modified version of a pig that represents a resource. The resource hog can help generate resources for the player through the following two ways. Killing the resource hog. This causes it to drop bacon which can be converted into the resource. By default one to three bacon will drop, and they are worth one of the input resource each. Digging for truffles. If the resource hog is in a valid dimension and is standing on top of a block that it can dig through, it will start to dig up truffles. These truffles can be turned into the resource without killing the pig. By default four truffles is equal to one input resource. To get a resource hog, you need a normal pig and a bucket of mud. By default a bucket of mud is crafted with a water bucket, a piece of dirt, and one of the input resources. Applying the bucket of mud to the pig will start the conversion process. 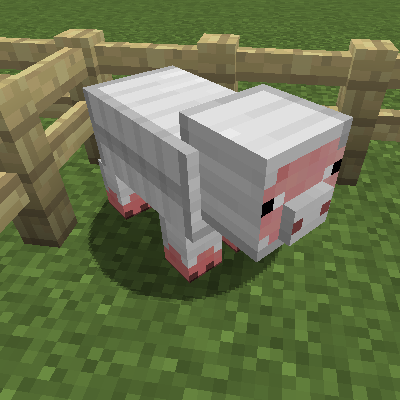 Alternatively you can get a spawn egg for the hog, however this option may not be available in your modpack. Applying speed potions to a resource hog will cause it to dig faster, and find more truffles. Higher levels of speed will cause the resource hog to dig even faster. For example speed 1 will cause the pig to go twice as fast, and speed 2 will cause the pig to go three times as fast. Truffles can only be dug up if the space above where the pig is digging is empty. The pig must also be in the right dimension, and on top of a block that they can dig through. Truffles will automatically break if the block below them is removed. This means that things like pistons can be used to automate the process of breaking truffles. The available resource hogs are loaded from json files that the modpack author must create. These files are loaded from the config/resourcehogs/types folder. You can find an example of what the file should look like here. Another example with all the default values can be found here. The following is a brief explanation of each property. id - The id for this resource. This must be lower case and unique for each resource type you add. This should also match the name of the file used. inputs - An array of the various inputs you can use to make a resource hog. You can use ore:oreDictName to specify an ore dictionary input, or mod:item:meta to specify a specific item. output - The item to output for this resource. This should be a specific item using the mod:item:meta format. diggableBlocks - This is used to define what blocks the hog can dig in. This is an array of blocks using mod:id:metaformat. renderBlock - The block the hog should look like. This uses mod:id:meta format. validDimensions - This is an array of dimension ids that this pig can dig in. If it's in the wrong dimension it wont dig. maxHealth - The amount of health the hog has. movementSpeed - How fast the pig is normally. armorAmount - An amount of armor protection to give the hog. digTickDelay - The amount of time in ticks it normally takes for the hog to dig up a truffle. This mod has automatic support for tinkers construct. If a resource type is created, and the output item has a smelting recipe, the player will be able to smelt the bacon and truffles under the same conditions. For example, if you make a resource type with an iron ingot as the output, in tcon you can smelt iron ingots into molten iron so you will be able to smelt the truffles and bacon into molten iron as well. By default 1 bacon smelts into the same amount of fluid as the output item. Truffles will produce 1/4th the amount of fluid.